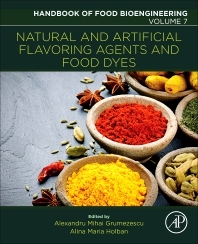 Natural and Artificial Flavoring Agents and Dyes, Volume 7 in the Handbook of Food Bioengineering series, examines the use of natural vs. artificial food dyes and flavors, highlighting some of the newest production and purification methods. This solid resource explores the most recent trends and benefits of using natural agents over artificial in the production of foods and beverages. Using the newest technologies and evidence-based research methods, the book demonstrates how natural flavoring agents and dyes can be produced by plants, microorganisms and animals to produce higher quality foods that are more economical and safe to the consumer.